When I arrived in Minnesota for the first time last June, I was but a visitor — assigned as Apostolic Administrator to help with the operations of the Archdiocese until Pope Francis named a new Archbishop. In the nine months since then, I have been blessed to witness your deep faith and your commitment to Christ’s Church, His people, and the Eucharist. I consider many of you friends. 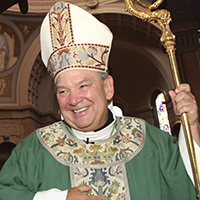 That is why it is with joy that I tell you of Pope Francis’ decision to appoint me as the next Archbishop of the Archdiocese of Saint Paul and Minneapolis. The Pope and the Holy Spirit evidently had different plans for me than I had anticipated, and I am humbled and honored to be named your shepherd. I know from my nine months in the Archdiocese that there is much work yet to be done to overcome the significant challenges we continue to face, but I am firm in my conviction that the Lord is truly present here, even in our struggles. The exceptional staff and leadership team at the Archdiocese, along with our strong priests, committed religious, and dynamic lay leaders are all reasons for great hope. You all seem to work tirelessly to serve Christ and His people no matter where they are found and for that I am most grateful. It has already been an honor serving you and I very much look forward to continuing to serve you and this vibrant community for as long as the Lord sees fit. Now more than ever, I will be counting on your prayers and support. Be assured of my prayers for you, your families, and this local Church.